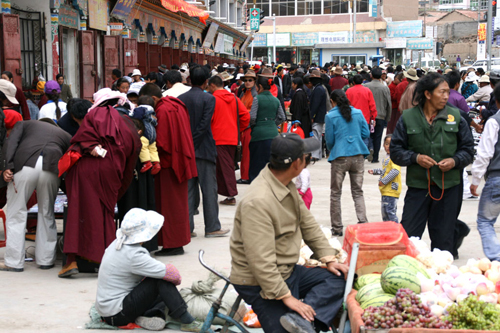 Reading foreign news reports about the Yushu earthquake, it was clear that large numbers of Tibetan monks had participated in the rescue efforts in the aftermath of the disaster. If, however, you had only relied on the Chinese state media, you would never have known they were there. In a classic case of Communist style photo-shopping that would make Mao proud, the Tibetan monks have been airbrushed from the picture. In the Chinese media, you can only see Han Chinese rescue workers and the Peoples’ Army, rescuing hapless and grateful Tibetans from the ruins. 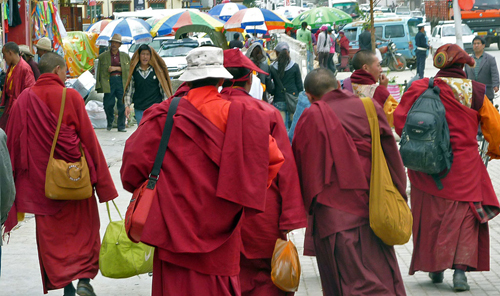 To add insult to injury, the government is now actually ordering the monks out of Yushu, for fear that these burgundy-clad heroes might become too popular in an area where 97% of the population is ethnically Tibetan. 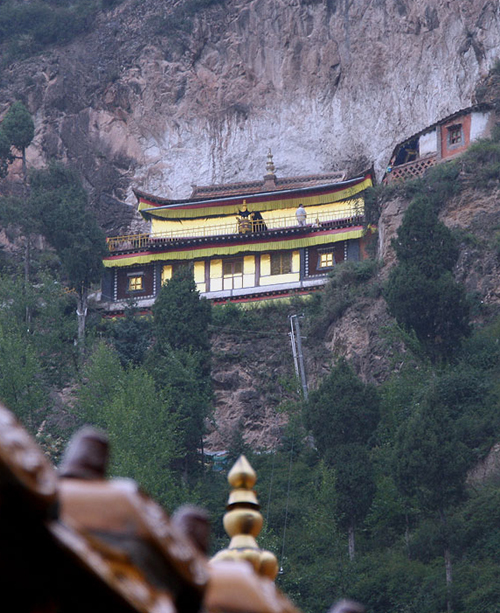 Most of the monks have come from the neighbouring province of Sichuan, from the huge monasteries of Serxu/Serchul and those around Ganzi. 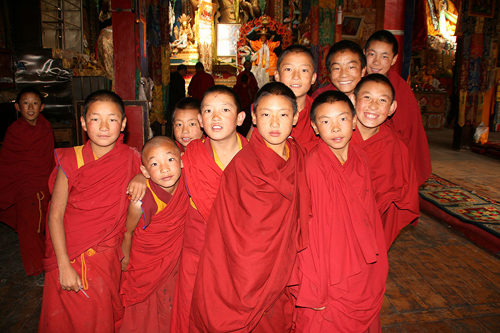 These monasteries are known for their devotion to the exiled Tibetan spiritual leader, the Dalai Lama. Something we witnessed last year. 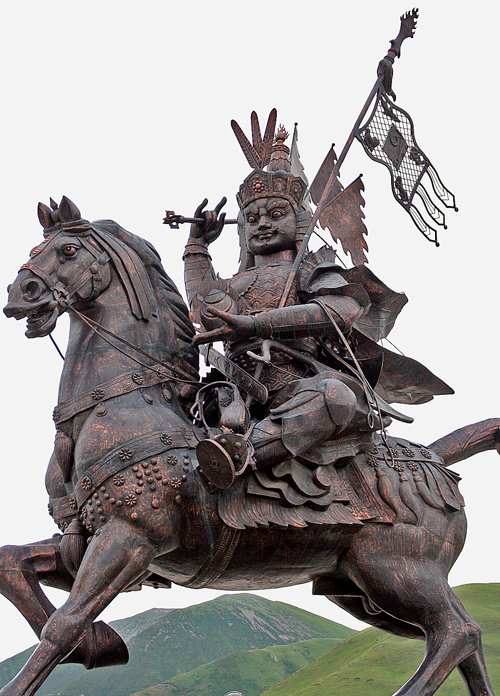 The pity is that the earthquake might have served to bring about a better understanding between the Han Chinese and the Tibetans. 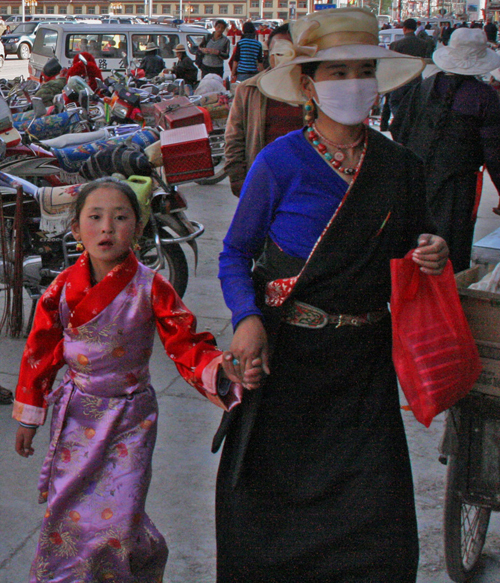 Instead, most Chinese will never know that the monks where there helping, and the Tibetans will again feel that the Chinese are now going to move in and control the area even more tightly than before. 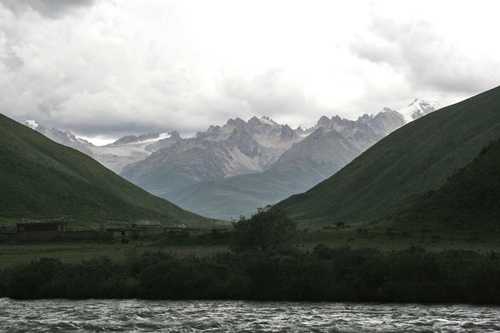 There have been very few personal accounts of the tragedy in Yushu. But Losang, the creator of the Land of Snows Website, has written a first- hand account of how he and his family were caught in the earthquake. 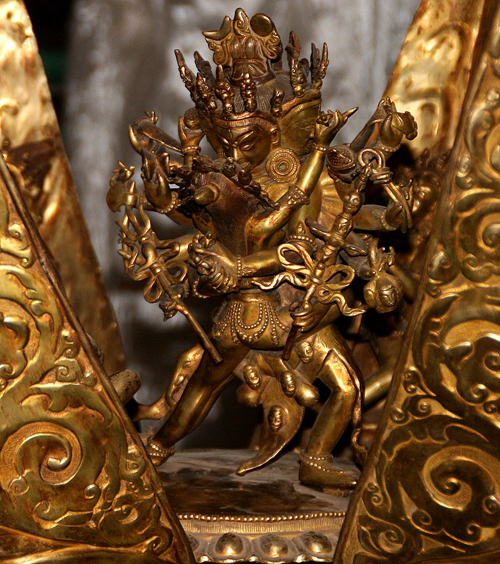 The reports I have heard from Yushu say that Thrangu Monastery has been almost completely destroyed and many of the monks are missing. 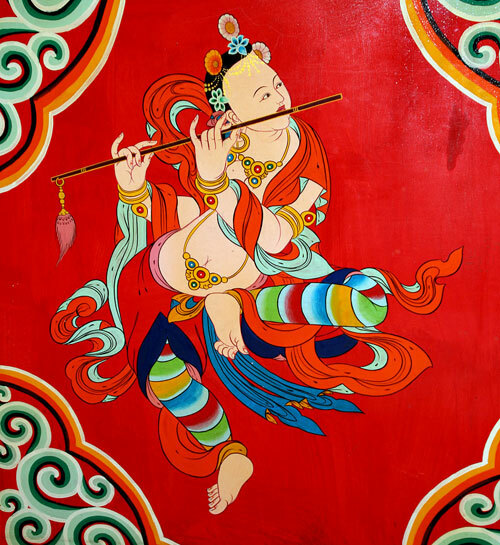 We spent a wonderful evening at Thrangu Gompa being shown the fantastic murals and wall paintings that had been recently painted by master painters from Tongren. The monks were so enthusiastic and proud of their monastery. We can only hope that they and the paintings have survived. For anybody who has been following our blog over the last few months, you will know that we were in Yushu and the surrounding area last year. It is one of the most stunning and fascinating areas of China we’ve visited. It’s difficult to express how we feel at the moment. Sitting here in the comfort of our flat in Madrid, the catastrophe in Yushu seems a world a way, and yet so close. We can only hope that the people we met and their families have survived this tragedy. We pass quickly through Serxu Xian, the modern administrative town, 35 kilometres after the huge Serxu monastery. Our driver seems concerned that the local police may look for an excuse to fine him, just because he has Qinghai number plates. It feels like a long drive now. Progress is brisk, as the road is paved and in reasonable condition, but in general, signs of life are few and far between; we pass a few Tibetan villages with the odd monastery. In some places the landscape is a bit less harsh; we pass a large lake, surrounded by soft, green hills. I could see the doubt in the driver’s eyes. Either he thought Christmas had arrived early, or, more likely, he was contemplating some grim and rapid end to his life. 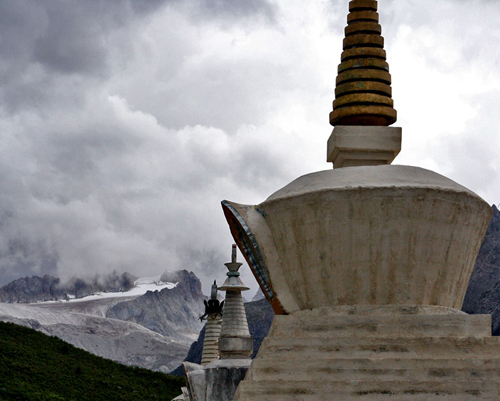 What we had proposed was the following: Yushu to Manigango in a day, with stops at Serxu Gompa and Dzogchen Gompa. 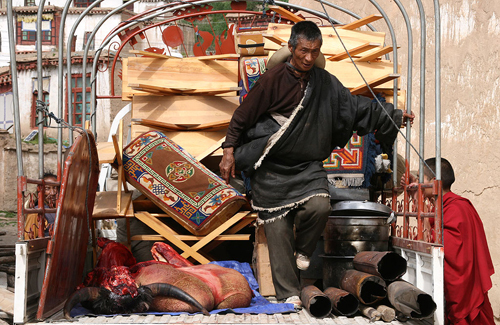 His reservation: his claim that Sichuan Tibetans were not honest like the Tibetans who lived in Qinghai. The word ‘Manigango’, he repeated it several times with distaste, evoked some kind of hellhole from which you’d never return. “Bandits, the lot of them; what if I just drop you at Serxu?”, he protested. 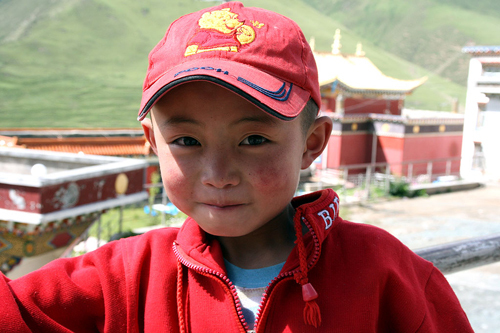 His incentive: The 1,000 Yuan I was offering, plus food and accommodation in Manigango. I pointed out to him that we had been to Manigango in 2004 and found it quite safe. Even though we too had heard numerous stories of pillaging bandits around Manigango, these seemed to belong to an era long gone. Still, I remembered that Manigango had felt like a real Wild West frontier town in 2004. 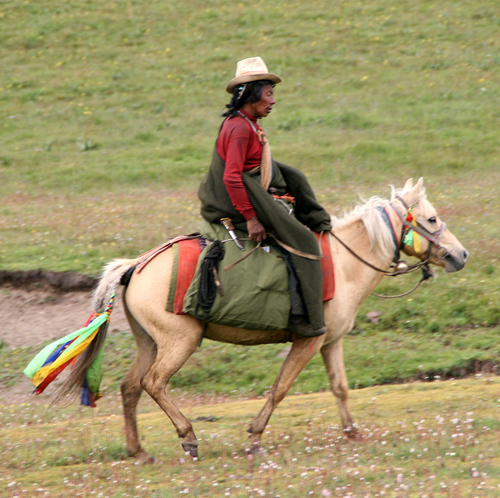 The main problem was that I had no option: the altitude sickness was playing havoc on my body; five days without sleep and the Tibetan medicine and the oxygen tank were having little or no effect. Serxu, at 4,200 metres above sea level, is another 500 meters higher than Yushu; lingering around, counting on dodgy bus schedules, didn’t appear to be the best option. So, basically, the upshot was: “Either you take us or we’ll have to hire another car”. Price agreed and the driver’s mind set somewhat at ease, we set off at 6.00 am. 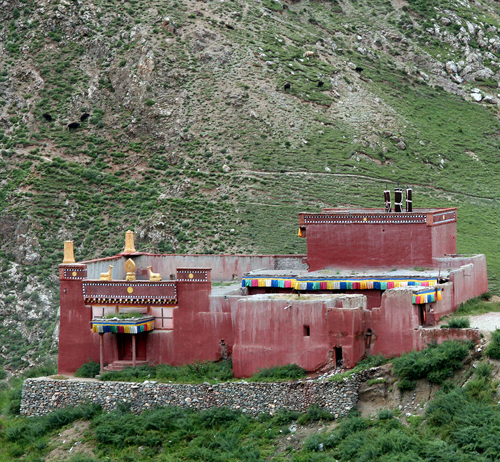 Last year we visited the Monastery of Youning Si in the Huzhu Tu Autonomous Region of Qinghai near Xining. 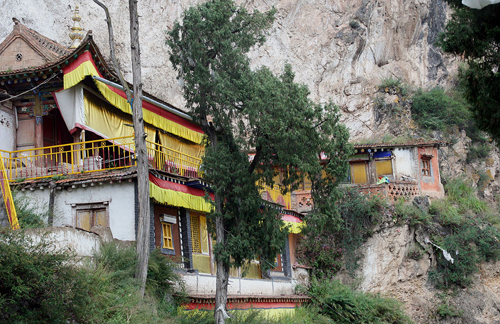 The Monastery is famous not only for its beautiful setting, but also because the monks are descendants from the Mongols and continue to speak an old Mongolian dialect. They are known as the Tu minority. We visited Youning Si by taking a bus to the town of Ping’an and then hiring a taxi the rest of the way. 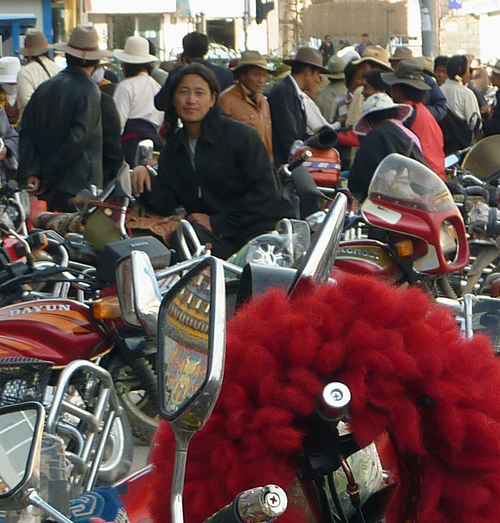 We never saw a check point or a police patrol during our entire visit. 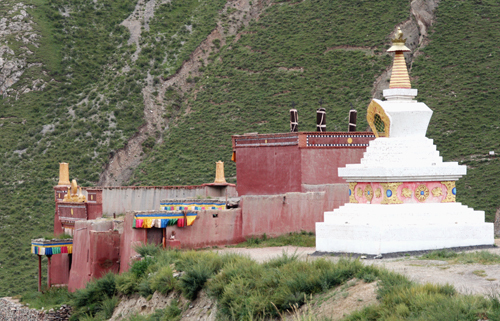 We start our second excursion around Yushu at the nearby Domkar Gompa, scenically located on the mountainside, overlooking the main road. Today, our driver has brought his little son along, a boy of about five, with a Fu Manchu pigtail at the back of his otherwise bald head. Both father and son are in good spirits, as if they are looking forward to the day’s sightseeing as well. 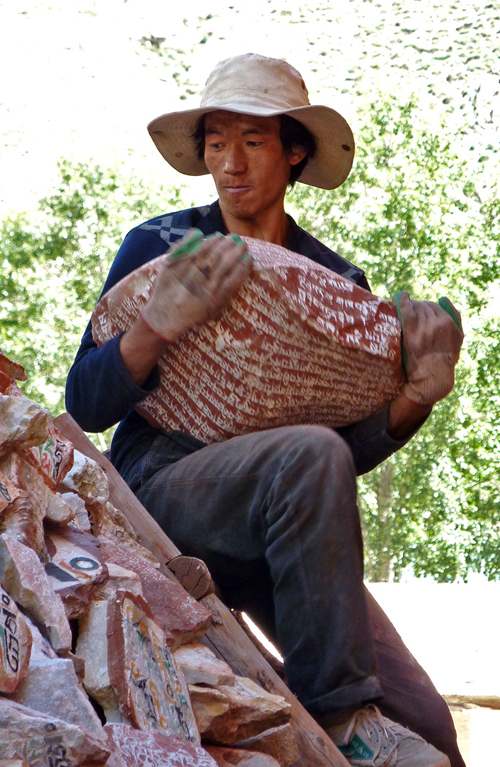 I’d been racking my brains out, trying to find an adjective with which to describe Yushu. Beautiful it isn’t; old and quaint neither. Calling the town modern and vibrant would perhaps be going a bit too far, but then again, modern and boring wouldn’t do it justice. Is it ugly? In some ways yes, the new buildings are pretty bog-standard Chinese white-tiled affairs. 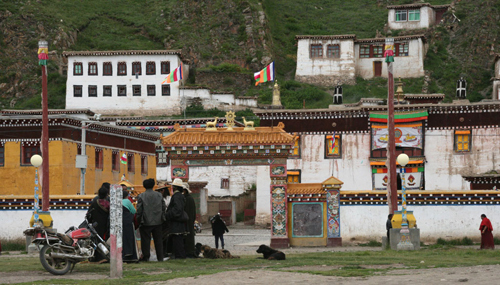 But that would be too harsh a verdict: the surrounding mountain scenery, the ramshackle old monastic quarters, but most of all, its people lend Yushu a special air. And that’s when I hit upon the epithet ‘funky’. 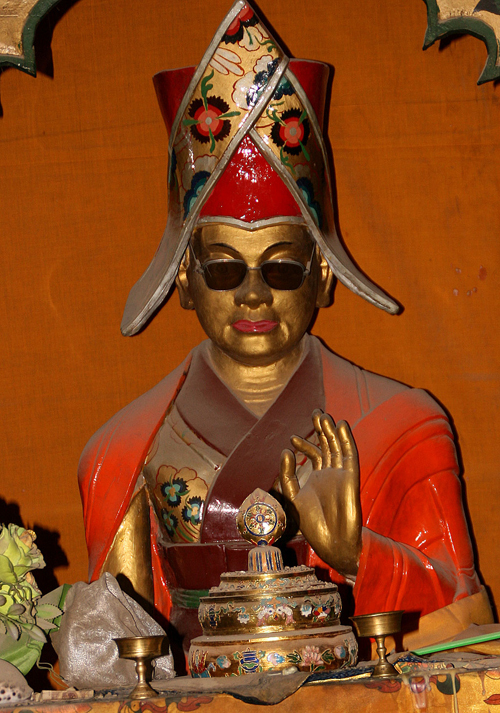 Yes, Yushu is pretty funky. 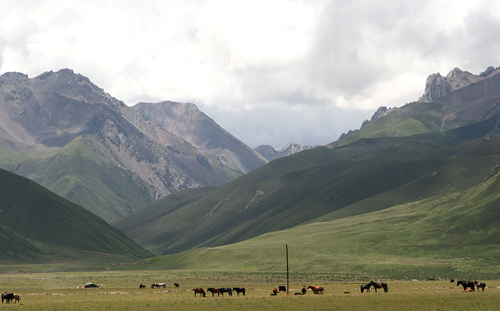 One more thing you can say about Yushu is that it is remote. 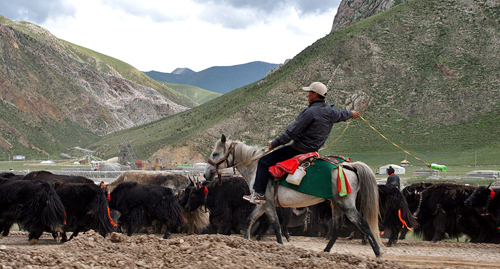 The town is situated in one of the remotest areas of one of China’s remotest provinces, Qinghai; so getting there takes a bit of an effort. It is actually a pretty uncomfortable 16 to 18 hour bus ride away from Xining, the capital of Qinghai (though the recently opened airport will change all this). 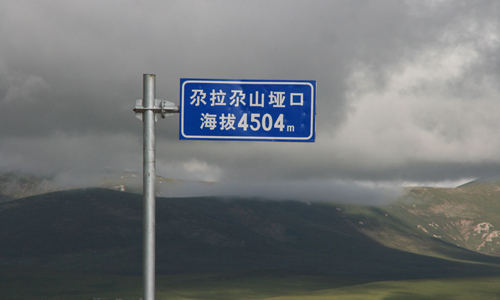 This feeing of discomfort, characteristic of any Chinese sleeper bus, is heightened by the extreme altitudes at which the bus has to travel: On route there are several passes over 4500 meters and the Qinghai Plateau never drops below 3000 meters. 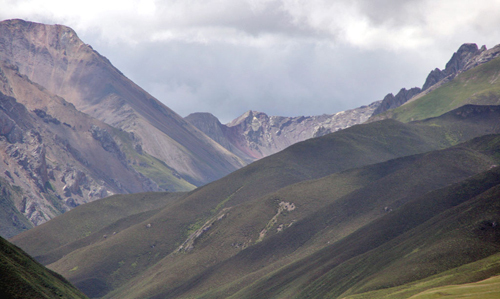 Only three kilometers from Yushu lies one of the great sights in the Tibetan world, the Seng-ze Gyanak Mani Wall (), reputedly the largest in the world. 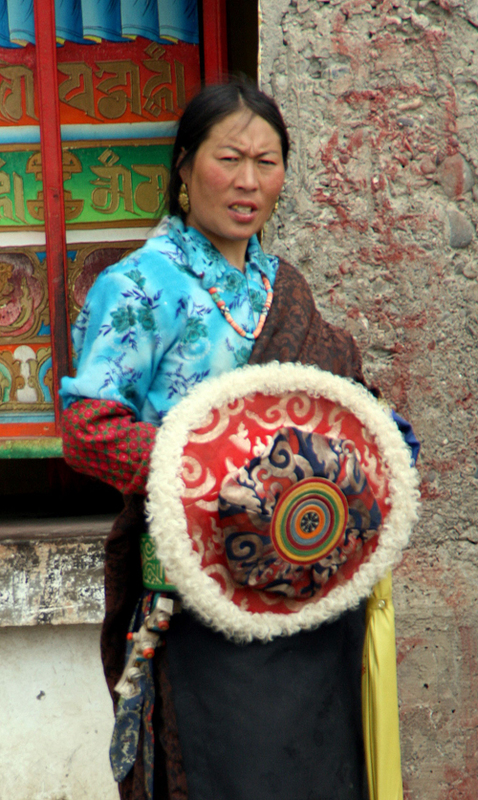 Found all over the Tibetan lands, Mani Walls are rows of piled-up stones, engraved or painted with orations. The size of such Mani Walls can vary from the humblest pile to a circuit of several hundred meters. 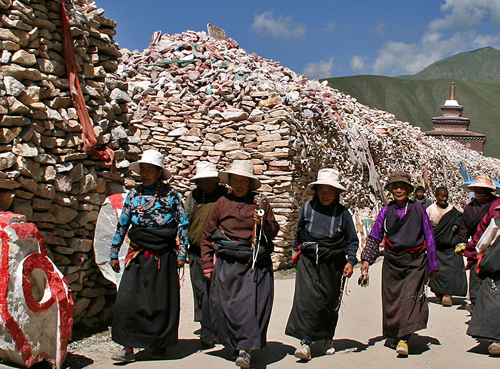 Pilgrims walk round these walls of holy stones in a clockwise direction, uttering prayers and twirling prayer wheels. The Seng-ze Gyanak Mani Wall is truly enormous; a sign by its side proudly proclaims that it is 283 metres long, 74 metres wide, 2,5 metres high and consists of 2 billion stones! 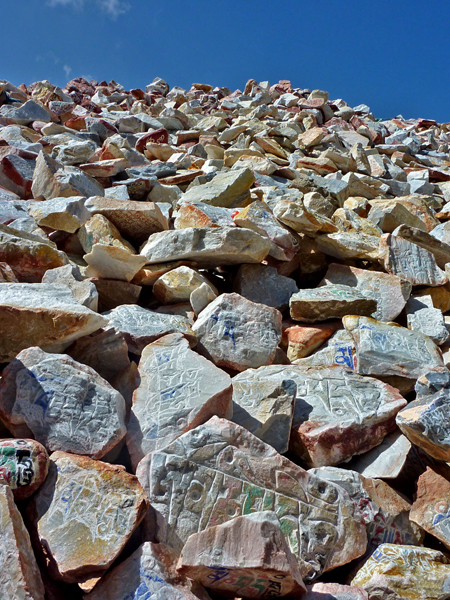 What’s more, the Wall is still growing, as we witnessed with our own eyes: devout pilgrims contribute new stones everyday, which are hoisted up on to the pile carefully. 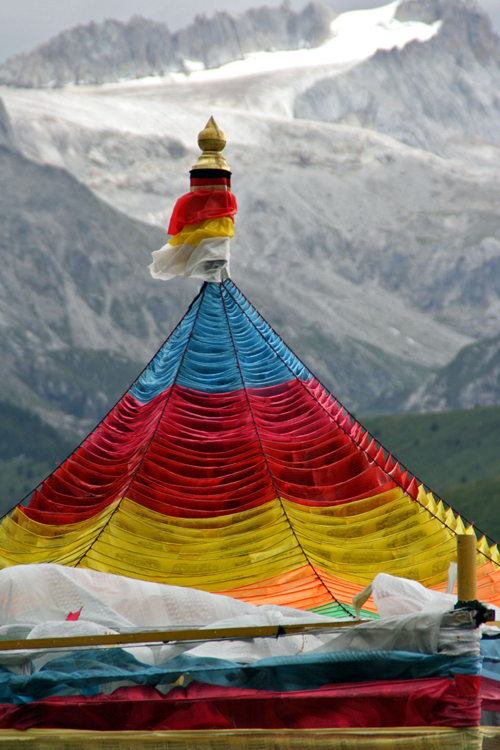 The billions of beautifully carved stones carry the Buddhist prayers “Om Mani Padme Hum” or, “Hail to the Jewel in the Lotus”, and other orations. Deliberations of an oxygen-deprived traveller. After 4 nights of me coughing, wheezing, gasping for air and not having slept a wink, we took the decision not to stay the night in Nangchen, but to just take a day trip in that direction instead. 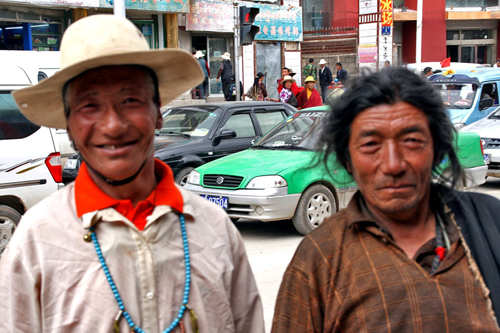 The fact that I was hooked up to a rusty oxygen tank at the time, in a friendly, but far from salubrious, local Tibetan clinic in Yushu, had something to do with it as well. My altitude sickness was a weird phenomenon: while I was all right during the day, I spent most of my night’s sleepless, and at times hallucinating and babbling gibberish. 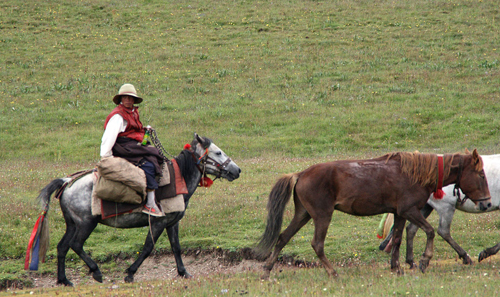 On the road to Nangchen.